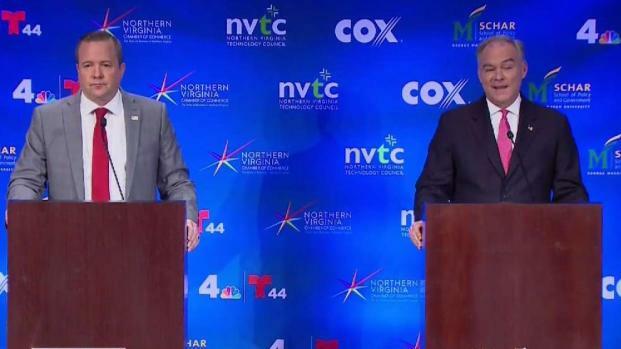 Democratic Sen. Tim Kaine and Republican challenger Corey Stewart debated in Northern Virginia Wednesday evening on NBC4. NBC News political director and "Meet the Press" moderator Chuck Todd moderated the debate, and News4 Northern Virginia Bureau Chief Julie Carey and anchor Aaron Gilchrist were on the panel along with George Mason University Dean Dr. Mark J. Rozell. 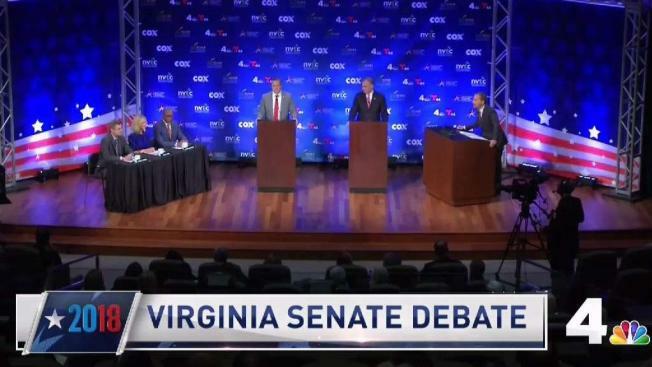 The candidates in Virginia's U.S. Senate race had a quarrelsome first debate in July, with President Donald Trump serving as a frequent focal point of the sparring. Stewart, a one-time state chairman of Trump's presidential campaign, accused Kaine of being an ineffective elitist who puts his opposition to the president above all other considerations. Stewart said Trump-backed tax cuts and increases in military spending were helping Virginia's working class and chided Kaine for not being more supportive. Moderator Chuck Todd asks the candidates about the current standoff over Supreme Court nominee Brett Kavanaugh. Kaine, a former vice presidential candidate seeking his second term in the Senate, said he's worked with Trump on areas of common agreement but always puts Virginia's interests first. Kaine said he's a needed check against the president and mocked Stewart for saying the president was "standing up" to Russia. A survey conducted Sept. 4-9 for the University of Mary Washington by the national research firm SSRS found Kaine had a 51 percent to 33 percent margin among registered voters and a 52 percent to 36 percent margin among likely voters. Libertarian candidate Matt Waters received 5 percent support in both subsets.